Truth be told, very few ventures can be compared to beekeeping. This is one of those activities that can be transformed within no time from a hobby to a commercial grade enterprise. Most pro beekeepers started off as hobbyists and eventually scale up. Beekeeping equipment including the honey bottling tank are essential for success in any beekeeping venture. This is one of those implements that come in handy once you have harvested your honey. It preserves the honey and keeps it away from any potential contamination. Honey never goes bad and that can explain why it is used as a preservative in most industries. It is also repellent to contaminators such as bacteria and fungi, hence the reason why it is used for treating wounds. It is very easy to store honey. In fact, honey that has crystallized can easily be restored with the use of a honey bottling tank. Honey in itself is a preservative but it has to be kept in a cool location where there is no direct sunlight. The honey bottling tank should be well sealed as well so as to prevent any unwanted materials from contaminating the honey. Food safe plastics and glass containers are ideal for honey storage. Metallic containers are not ideal for storing honey since most of them can oxidize. However, rust resistant and food safe metallic tanks can be the best for storing honey. Refrigerators are not recommended for honey storage since extreme cool conditions solidify honey. You will therefore be forced to warm it up whenever you need to use it. Honey may also be frozen but this is not necessary since it never goes bad even under normal conditions. Heat and moisture are the greatest enemies to stored honey. Never expose honey to heat or allow moisture to build up in the bottling tank. Honey is best kept under normal room temperatures. If you reside in a house that is warm, then lookout for the coolest places within the building and keep the honey bottling tank there. It should also be stored away from any heat-producing appliances such as stove, sunlight, and others. The best way to keep honey free from moisture is by storing it in an airtight container. Fortunately, most honey bottling tanks have tight seals. You should also use a dry spoon whenever you dip into the tank. Honey bottling tanks have become essential items to beekeepers since they help keep the honey fresh and safe from contamination. Most honey houses have at least five or even more honey bottling tanks. If you are a small scale beekeeper then one or two honey bottling tank suffice. You can start out with one then add one later on when your enterprise expands. Check out the top brands and choose those that offer the best quality products. There are many brands out there that manufacture beekeeping equipment including the honey bottling tanks. Let’s check out the best honey bottling tanks. To start of our list of the best honey bottling tanks is the is the 25 litre settling tank from simonthebeekeeper. This is a superbly built honey storage tank that is designed using good quality material. 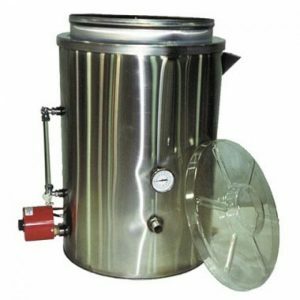 This honey settling tank is ideal for those who are looking for something that is durable and offers a speedy delivery. It is best suited for small scale or hobbyist beekeeping operations, whether a two hive apiary of ten hive apiary. The unit has a dimension of 32 cm by 45 cm in diameter and depth respectively and has a capacity of 60 pounds. Speedy delivery through the honey tap. 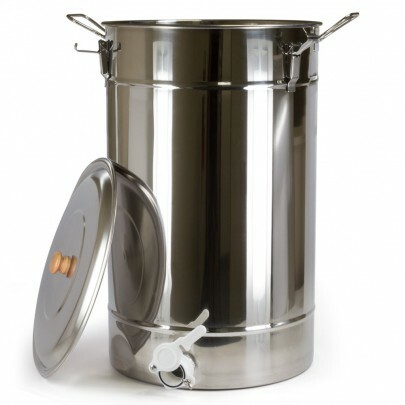 Comes with a metal bucket handle in addition to a tight fitting lid. Designed using sturdy and longer lasting material. Excellent capacity to meet the needs of small scale beekeeping operations. Width and height are 32 cm and 45 cm respectively. Capacity of 60 pounds of honey. Mann Lake is a brand that has become a household name to most beekeepers. 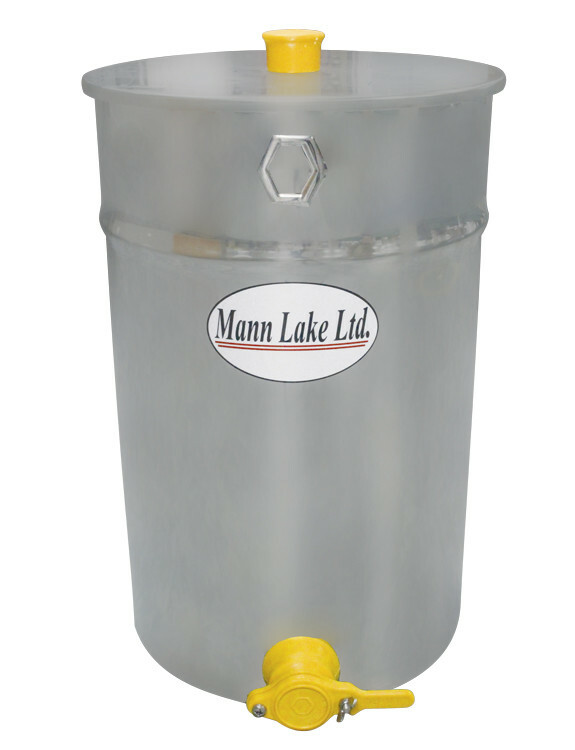 The 166 gallon honey storage tank from Mann Lake is designed using stainless steel and can hold up to 110 pounds (50 kgs) of honey. The unit is insulated for safe and energy efficient heating. It is capable of producing hundreds of jars of honey a day and can also decrystalize dormant honey. Its huge capacity makes it a great fit for small to medium sized beekeeping operations. Has a capacity of 166 gallons. Capable of producing plenty jars of honey per day. Long lasting and reliable unit. Quality for money honey bottling tank. 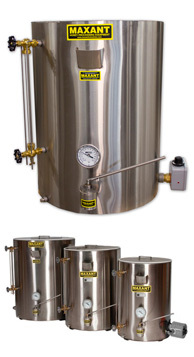 The 22 gauge stainless steel construction honey storage tank from Miller Bee Supply is a top notch tank for the savvy buyer. Its 18/10 food grade stainless steel wall is durable and reliable. The unit also has a removal stainless steel filter insert that can be used for straining the honey of any impurities it may have before bottling it. It also has a stainless steel lid and a plastic honey gate. Its capacity of 132 pounds makes it a perfect fit for most beekeeping operations. Made with a 22 gauge 18/10 stainless steel construction that is food safe. Has a capacity of 132 pounds. Dimensions of 25 inches depth and 12 inches in diameter. Has a stainless steel lid and a plastic honey gate. Its removal stainless steel filter insert transforms the tank into an excellent bottling tank. This is ideally one of the least priced honey storage tanks in the market. 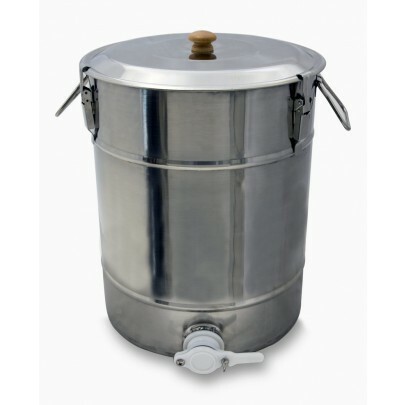 It is made of stainless steel and has a capacity of 9 gallons. The tank is designed for those who have harvested the and filtered honey but would like to keep it for bottling later. 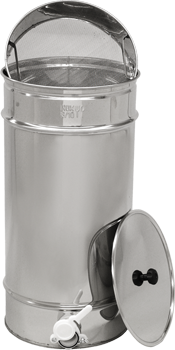 It is designed using a food-grade stainless steel material and comes with a perfectly-fitting stainless steel lid. It also has two handles on each of its sides and comes with a plastic honey gate. Made of food safe stainless steel material. Holds up to 9 gallons of honey. Has two handles for easier lifting. Comes with a plastic honey gate. Its well-fitting lid is made of stainless steel. Has dimensions of 22.25 and 12.5 in depth and diameter respectively. One of the least expensive units in the market. If you are looking for a honey bottling tank that offers the a great combination of quality and price, then this should be a good fit for you. It is made of stainless steel which is sturdy and longer lasting and comes at an affordable price. The unit is also extremely spacious with its 18 gallons. It also has a removable stainless steel lid and two handles that make it easy to carry around. The tank is fitted with a plastic honey gate that allows the honey to flow effortlessly from the unit. The stainless steel construction is food safe. It has a capacity of 9 gallons. Comes with two handles that makes it easy to carry the unit. It has a plastic honey gate. The unit has a well-fitting lid made stainless steel. Its dimensions are 22.25 and 12.5 in depth and diameter respectively. It is one of the least expensive units in the market. Kelley Beekeeping is one of those brands known for its excellent quality beekeeping appliances. 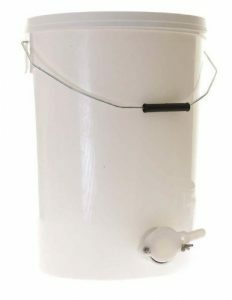 The 25 gallon honey bottling tank is ideal for storing or bottling honey. It is made of 18 gauge stainless steel and is double walled. The unit is also capable of producing up to 200 jars of honey a day. Available also with the unit is a Chromalux immersion heater, brass plugs, site water gauge, and a thermometer. It also has a stainless steel no-drip valve. It has a 18 gauge double stainless steel wall. Can hold up to 25 gallons of honey. Produces up to 200 jars every hour. Comes with a Chromalux immersion heater, stainless steel no-drip valve, site water gauge, brass plugs, cover and thermometer. It is a reliable, durable, and sturdy unit. This is another excellent unit from Kelley Beekeeping. The 42 gallon honey bottling tank is designed for use both honey storage and bottling. It features a 18 gauge double stainless steel wall that ensures the honey is well preserved and kept away from contaminators. 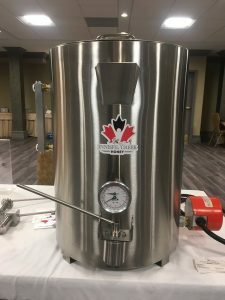 It is capable of producing 200 jars of honey per hour and is delivered with a site water gauge, thermometer, Chromalux immersion heater, brass plugs, and a non-drip stainless steel valve. It features a 18 gauge double stainless steel wall. Holds 42 gallons of honey. Capable of producing up to 200 jars per hour. The unit is delivered with site water gauge, a Chromalux immersion heater, brass plugs, stainless steel no-drip valve, cover and thermometer. The unit is highly reliable, durable, and sturdy. The 300 pound double walled honey bottling tank from Dadant has emerged as a top choice for apiarist, beekeepers, and honey farmers. The unit is designed for keeping honey for later use or producing 100s of jars every hour for distribution and consumption. This unit also de-crystallizes honey and this is a plus. It is double walled for durability, reliability, and longevity. Keeps honey in excellent condition for as long as required. Produces hundreds of jars of honey per hour. Excellently built and of good quality. It has a capacity of 25 gallons which meets the needs of most beekeeping ventures. If you have been searching for an excellent capacity and quality honey bottling tank, then this item is well worth your consideration. The Maxant 16 gallon bottling tank not only has a good capacity but it is also designed using sturdy and durable material. The exterior to the core are ingeniously designed with the ultimate user in mind. Its double wall with 18 gauge reinforcement ensures the honey within is kept in excellent condition. The tank also de-crystalizes dormant honey. It also comes in 6 models for you to choose. It has an 18 gauge double wall. Produces more than 200 jars of honey within an hour. Ideal for storing honey for bottling later on. Comes with immersion heaters, brass plugs, no drip valve, water gauge, thermometer and cover. It is available in 6 models. Holds up to 42 gallons of honey. Stainless steel wall is durable, reliable and longer lasting. Designed by Innisfil Creek Honey is this top-notch honey bottling tank that has a capacity of 16 gallons (64 litres). It is capable of holding 85 kgs of honey which is an excellent capacity to cater for most beekeeping firms. This unit meets and even exceeds food establishment requirements. It has a 120V and 1300 watt submersion heater. It also comes with a stainless steel folding lid, an internal thermometer and a fluid level gauge. These helps keep a check on the honey so as to ensure you are not overheating it. This unit is ideally designed for larger scale honey producing beekeepers. 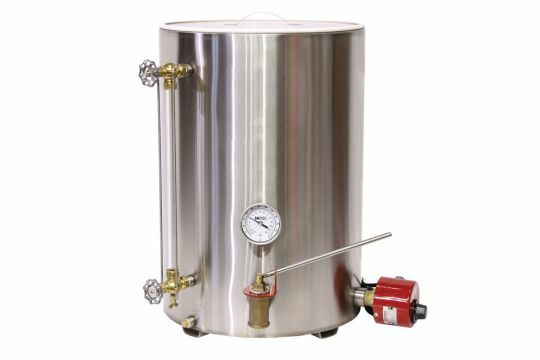 It is double walled and is jacketed using stainless steel. All edges and surfaces are seamlessly crafted with precision. Comes with a build in thermometer. It has a 16 gauge stainless steel wall that is double walled. Comes with a sight level gauge. It has a 120 volt and 1300 immersion heater that has an inbuilt thermostat that is adjustable. It has a jacketed water compartment. The best honey bottling tanks are ideal and well built. They each cater to beekeepers at different levels. They are not created equal and therefore you have to check out each individual unit before making your purchase. Choose a unit that offer the best in price, quality and meets the needs of your operation. Do you own any of the hone bottling tanks on this list? Which honey bottling tank(s) do you think should be added to this list? Leave a comment below and let us know.